During their early, formative years, Yes paid several visits to the BBC to record material for radio programmes. The BBC's enthusiasm for bands to re-record tracks for broadcast, rather than simply playing album tracks by them, was not as enlightened as it may at first seem. At the time, the Musician's Union was far more powerful than it is now. Radio stations were only permitted to play so many hours of records each day, the balance having to be made up by live performances. This meant many bands, including prog combos, visiting the BBC to record sessions. In many cases, these recordings were virtually the same as the original recordings, to the extent that it could be difficult to tell whether or not you were listening to the original recording. One of the main clues as to the origins of these performances is that they are largely recorded in mono, radio not being widely available in stereo until a few years later. The tracks here are taken from the period before the band made their ground-breaking "The Yes album", and are thus pre Howe and Wakeman. This however gives us another opportunity to evaluate the work of early band members Tony Kaye (keyboards), and Peter Banks (guitar). Most of these tracks appeared in their original form on either "Yes" or "Time and a word". Those that did not have either been included in compilations, such as "Yesterdays" and the "Yesyears" box set, or have become bonus tracks on recent re-releases of the first two albums. In all, we have about half of each of the first two albums. Some tracks, such as "Then", "Every little thing" "Everydays" and "Sweetness" appear twice in different form (the "Millenium Collection" release calls these reprises or bonus tracks. 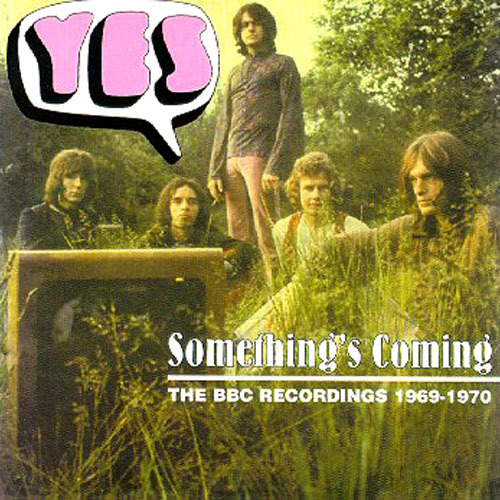 The opening "Something's coming" is an interpretation of a Sondheim/Bernstein number from "West side story", the Yes treatment making it barely recognisable as such. The track includes a brief run through "Troika" from Sergei Prokofiev's "Lieutenant Kije Suite", better known perhaps as the instrumental theme in Greg Lake's "I believe in Father Christmas". Classical themes pop up elsewhere from time to time, "Everydays" for example including a burst of Holst. "For everyone" is in some ways the most interesting track, as part of it later mutated into part of "Starship trooper" on "The Yes album". It is also the rarest track on offer here. The tracks on the first disc are all live in the studio performances, while some of those on the second are performed in front of an audience. There is overall, a raw excitement to the tracks which more than compensates for the dubious quality of the recordings. When compared to the more refined sound which first appeared on "The Yes album", and was rapidly developed through "Fragile", "Close to the edge", etc., things sound more than a little rough and ready here. Anderson's vocals are off key and often hard to listen to, giving little indication of the sophistication which would soon evolve on tracks such as "Yours is no disgrace" and "Starship Trooper". While I would hesitate to recommend this compilation to anyone other than Yes fans, it is nevertheless a worthwhile addition to a prog collection. These sessions have been repackaged and re-released on several occasions. "The Millennium collection" by Yes, one of a series of releases by various bands under the same name, is identical to this release and sells for a very low price. The discs run to a little over 40 minutes each, so with a little pruning of the duplicated tracks, this could easily have been a single disc package.